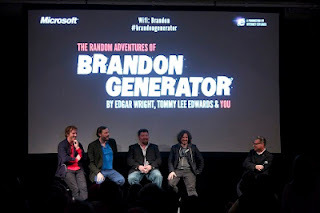 Illustrator Tommy Lee Edwards combined with acclaimed writer-director Edgar Wright on a four part crowd-sourced web series entitled 'The Random Adventures Of Brandon Generator' which saw its final part premiere in London last Wednesday at the intriguing Farmiloe Building in Farringdon. A thoroughly enjoyable evening, complete with art from the series as well as a Mark Kermode-led Q+A. 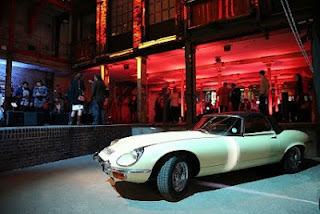 Having not been overly familiar with the series before going to the event, the evening was something of an eye-opener. The Brandon Generator animated series took advantage of web technologies developed by Internet Explorer 9 as well as sourcing over eight thousand ideas from the general public to drive plot points as well as in creating dialogue. Partly autobiographical, Edgar Wright's vision for the series saw a struggling writer lose himself in an existentialist dream-world, battling his inner demons and his coffee addiction. The series proved hilariously self-referential, carrying a deadpan humour expertly delivered by narrator Julian Barratt, most popular for his work in 'The Mighty Boosh'. The event itself showcased the extraordinary artwork of lead animator Tommy Lee Edwards, with stills from the series displayed all over the building, along with physical props such as the protagonist's car, and fascinating wall projections. Throw in some strong mojitos, lovely finger food, and we had ourselves a very nice evening even before the main event. Entering into a separate auditorium, we were treated to the first showing of the four episodes together as one whole series. An impressive series, at that - although I did wonder what it would have been like to see what Edgar Wright would have produced without the crowdsourcing. Lauren FG amusingly pointed out that it would no longer be 'The Random Adventures Of Brandon Generator' and instead 'The Extensively Plotted Adventures...'. Following the screening, a Q+A was led by notable film critic Mark Kermode, joined by Wright, Tommy Lee Edwards, Julian Barratt and David Holmes, the latter of whom had worked on the excellent soundtrack with his new band, Unloved. The discussion focussed on the collaborative aspect of how the series came together and was developed, which was something of a global effort - only Barratt and Wright were ever in the same room together while working on the project. Wright was particularly grateful for the unique opportunity to take on board public ideas, comparing it to his experience in writing 'Spaced', where he had to avoid all discussion of that TV series. Lee Edwards noted the difficulty of making the project "cohesive", yet he felt they'd "pulled it off - a sentiment I think most of us in attendance certainly agreed with. Watch the full series at brandongenerator.com. With thanks to 3 Monkeys and Microsoft.